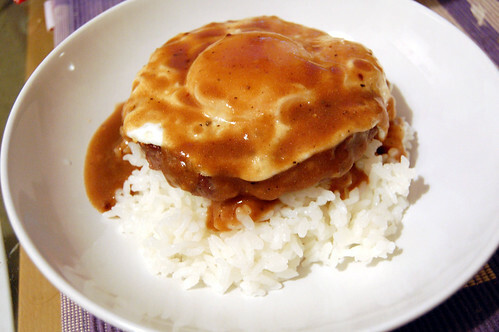 Loco moco…sounds “crazy”, doesn’t it?! This unique Hawaiian dish is quite popular over in Hawaii but not very well known in the rest of the world. Its components are neither exotic nor difficult to procure – hamburger, egg, gravy, rice – yet for some reason, it has intrigued me ever since I first read about it. I had to make it. And yes, it was good! It’s a comforting meal that’s easy to make on a weekday after work. You can either make your own hamburger patties or do what I did and just purchase them. There’s a stall at my farmer’s market that sells some quite nice ones. Heat a frying pan over medium heat and fry your hamburgers until done to your liking. Remove and keep warm. Either add more oil to the pan or remove oil – whatever you do, leave about 1 – 1.5 tbsps of oil in the pan. Add the flour and cook together until the roux darkens, stirring constantly with either a whisk or a spatula. Add the broth, whisking or stirring constantly. Add salt and pepper to taste. If you have a separate pan, fry your eggs in it. If not, decant your gravy into a bowl and keep warm. Use the same pan to fry your eggs. I like them over-easy. To put it together, on each plate or shallow bowl, place enough rice for 1 person. Top with a hamburger patty and top that with a fried egg. Pour gravy overtop. Dig in! We had some garlicky spinach on the side to, you know, be somewhat healthy! Hi Donna! I also watched Lunch Queen but I had forgotten that their hamburg rice was topped with a fried egg too! But which came first? I’m more inclined to think that the American influence in Japan led to the hamburg rice, which in turn led to the loco moco in Hawaii? Anybody? This sounds far tastier than it looks! Seems at first like a bizarre idea, but I can see the appeal! wow yours looks more delicious than they make it here in hawaii! I just heard about this dish about an hour ago from the Harvard Hawaiian Club representative. It intrigued me; this picture makes it look great. I might try it soon. Thanks for posting this information! Planethalder: 😀 See comment by mieternofugaz! Kiriel: The components by themselves are already good so…uh…the whole is greater than the sum of its parts. Mel: Do let us know it turns out! destineeisrad: I’m honoured, thank you! mieternofugaz: Wow…it seems kind of apt but I can’t really figure out why… Thanks for the translation! my husband’s favorite! thanks for stopping by my blog too. 😀 Do you make it often, Kat? no, maybe 2 times a year. AnnA: Packets of brown gravy? I probably shouldn´t be saying this but some of the Polish gravy packets I can get around here aren´t half bad! 😀 Might use one next time! I use package gravy also, easy and delicious. One restaurant/diner right outside Waikiki on Oahu is famous for the locomoce. I think it is close to that infamous local Luau shirt place. Anybody remember it? seems very delicious. i think your recipe gone help me more wile making it at home.